Many companies are looking to upgrade their traditional horizontal blinds with roller shades. Why? 1. Horizontal blinds do a great job at controlling light, but they can be hard to clean and after a few years may start to look dingy. Daily wear and tear can also leave blinds bent or broken. Roller shades are a lot more robust and are easier to keep clean. 2. 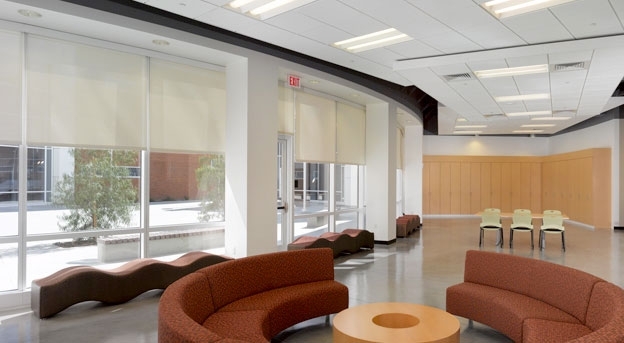 Roller shades are an easy and economical way to breath new life into your building. Many designs have a clean and modern look that can immediately update a room. 3. Roller shades are incredibly versatile. They come in a variety of fabrics and you can even have your own graphics printed on them. It’s like getting a window covering and signage in one! 4. Roller shades allow you to filter light without totally obstructing the view. 5. Solar roller shades are specially designed to block heat and can reduce the costs of cooling your building. 6. Roller shades are perfect for large windows that are often hard to fit with horizontal blinds. 7. When roller shades are up, they are practically invisible—unlike horizontal and vertical blinds where you can still see the slats when they are pulled up or back. 8. Motorized roller shades are perfect for hard to reach areas where it might be difficult or impossible to raise and lower the blinds. Some can even be programmed to lower or rise at different times of the day or respond to a sun sensor. Roller shades are also great for conference rooms that may have to be darkened quickly for presentations. 9. Some styles of roller shades don’t have any cords. These are great for buildings that are used by children because they don’t have dangerous loose cords that children can get tangled up in. It is no surprise that companies are switching from horizontal blinds to roller shades as a simple way to renovate their building. For help finding the right roller shades for your building, call us at (801) 299-0800. This entry was posted in Window Shades on July 15, 2013 .